If you didn’t follow the NFL last season, or even if you had, the idea that the Cleveland Browns are favored to win the AFC North must sound ludicrous. This is a team that was winless in 2017 and, while vastly improved, still had a losing record last season. Making the jump to division favorites—well, that’s a pretty big leap. Since the four-team AC North was created back in 2002, the Cleveland Brows have never closed as the division favorite. But with what they have done so far in the offseason combined with what the other teams in the division have been up to, that could change. They already had an up-and-coming offense with Baker Mayfield at the helm but then they went and added Odell Beckham Jr. to the mix. Teams will be forced to game plan for OBJ which will mean lighter coverage for Jarvis Landry, Antonio Callaway, and David Njoku. With the attention the passing game will require, the running lanes should be a little easier to find for Nick Chubb as well. 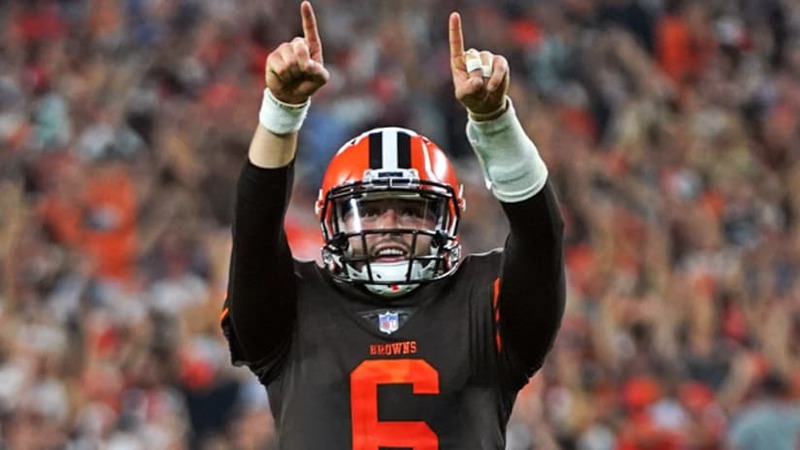 So, as long as Mayfield doesn’t hit the dreaded sophomore slump, the Browns offense is going to be a whole lot of fun to watch next season. But winning the division will take more than just a good offense, and their defense took a hit when the Browns included Jabrill Peppers as part of the trade package for OBJ. While they haven’t addressed the deficit at safety yet (draft), they did make some additions to the defensive front—Olivier Vernon and Sheldon Richardson. They, along with Myles Garrett, could give the Browns one of the best pass rushes in the game. It is safe to say that the Browns do look better on both sides of the ball. But that is not the only reason they opened as division favorites. The Steelers are not going to be nearly as formidable next season after losing Antonio Brown. While they did sign help, Donte Moncrief isn’t exactly going to make up for the loss. Baltimore came on strong once they benched Joe Flacco and went with Lamar Jackson last year. But the Ravens will essentially be a one-trick pony everyone has had months to figure out how to beat. Lamar Jackson is not a good passer and the defense is going to have a lot of holes to fill after getting gutted in free agency. As for the Bengals, well—there just isn’t any reason to think they are going to be much better (if better at all) than they were last year. The Browns are going to be an exciting team to watch next season. They have certainly made some impressive moves in free agency; so impressive that their Super Bowl odds are now among the leading contenders (+1400) and they are behind only the Chiefs and Patriots for the AFC (+800). Of course, while it all makes for entertaining news now, that doesn’t mean the Browns are going to win a game let alone the division. Teams that look great on paper lose all the time (but hopefully this one doesn’t).